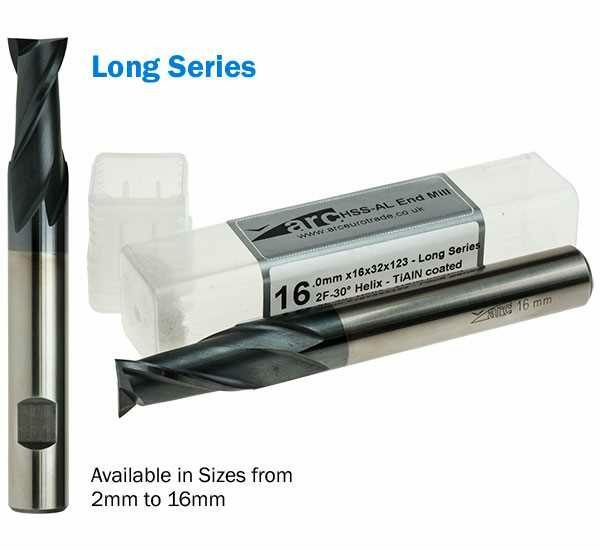 The ARC Premium branded range of end mills are made from a traceable grade of material. They are precision manufactured for consistency, quality and accuracy. For specifications, please click the Specification tab. HSS-AL is a specific grade of high speed steel with high carbon content (1.05-1.20%) and a small amount of aluminium (0.80-1.20%) as part of its chemical composition. The carbon in the material gives it its hardness (HRC66~68), and the addition of aluminium increases ductility as well as aiding heat dissipation. HSS-AL end mills are suitable for cutting copper, brass, iron, aluminium, hard steel and stainless steel at higher cutting rates compared to more conventional high speed steels. They also stay sharp longer and are suitable for general or heavy duty production applications. Two flute end mills have a larger flute volume and therefore a higher chip carrying capacity. Suitable for higher stock removal rates where finish is not critical. 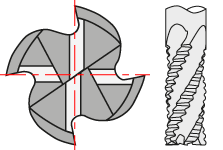 These are centre cutting end mills enabling the tool to plunge cut in the same way as a traditional slot drill (notice how one cutting edge is longer and passes slightly over the centre line). Three-flute end mills are often a good compromise between the high flute volume of 2-flute cutters and the greater strength and surface finishes of 4-flute cutters. 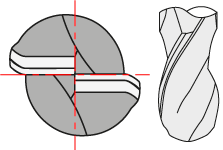 Centre Cutting: These are a centre cutting end mills enabling the tool to plunge cut (notice how one cutting edge is longer and passes slightly over the centre line). The serrated cutting edges of roughing end mills are designed reduce cutting forces enabling higher feed rates and greater metal removal rates. The serrated edges also act as chipbreakers to create smaller chips for easier swarf removal. 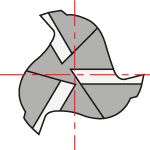 Centre Cutting: These are a centre cutting end mills enabling the tool to plunge cut (notice how two of the cutting edges are longer and pass slightly over the centre line). The hemispherical end of ball nose end mills make them ideal for machining 3-dimensional contoured shapes. 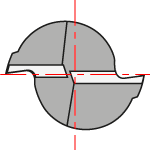 The end mill cuts a square corner. This is the most common type of end mill. 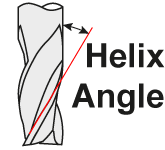 The helix angle is the angle of the cutting edge on the side of the cutter. 30° Helix: Generallly accepted as the industry standard for rigidity, sharpness and cutting edge strength. Adequate for cutting carbon steel and some tool steels. 40° and 45° Helix: Higher helix angles increase the effective shearing action and because the cutting forces are directed more vertically, tool deflection is reduced. Chip ejection is also improved thus reducing the amount of heat generated. These end mills are centre cutting which means they will plunge, drill or ramp into a cut. These end mills have a Weldon flat on the shank. Type N is a Standard end mill. Type NR is a Roughing end mill. These end mills are manufactured to the DIN 844 standard. These end mills are manufactured to the DIN 327 standard. These end mills have been optimised for cutting aluminium alloys. The Balzers Balinit® Futura Nano coating offers outstanding properties enabling high-performance machining and long tool life. In fact Balzers Balinit® Futura Nano not only out-performs uncoated cutters, TiN and TiCN coated cutters but also many other TiAlN coated cutters as well. Sharper cutting edges are possible with uncoated end mills and these are recommended for machining aluminum, brass, plastics and other non-ferrous materials.